Question for the Redmine Community: Bug fix releases or release new plugins? I wanted to make a short post to ask for some feedback on a question I just posted my development blog. I asked which people would prefer: "Bug fix releases to my existing plugins or the release of new plugins that are complete?" If you have a minute, I'd love to hear what you think. You can leave a comment here or on my original blog post. 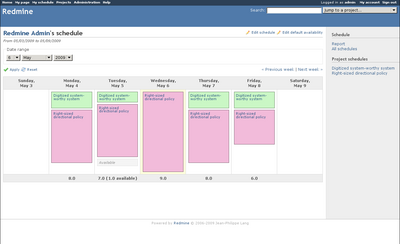 There's been a bunch of activity in the Redmine community lately. This post will highlight some of the major changes from September and October. Jean-Philippe Lang added group support to the Redmine trunk. 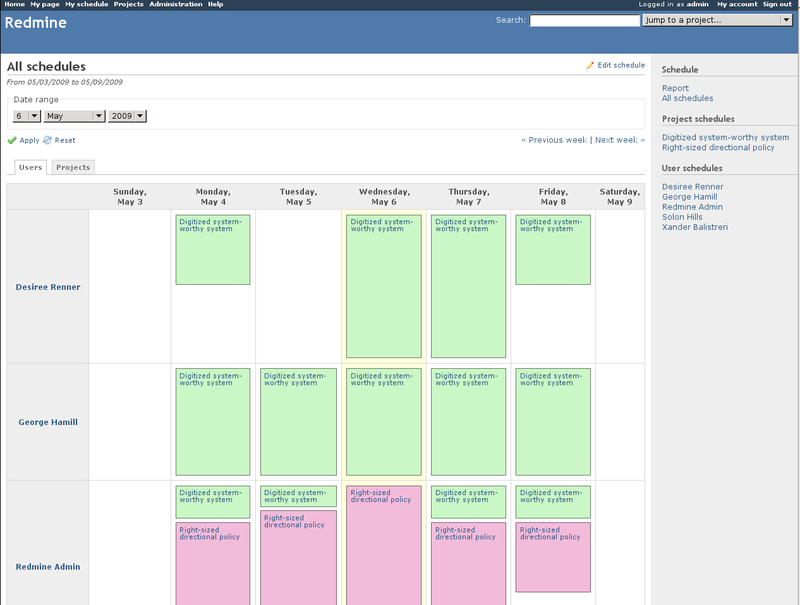 This makes it easy to assign a set of people to each project. Each group can be given an existing Role in Redmine so you can control their permissions using the existing settings. Added in r2869 for Issue #1018. Try to post an update to an issue with a file attachment. The update failed because someone else updated the issue first. Attachments would still be added to the issue, without a journal entry. r2875 changed this so the attachments would be deleted if the update failed (step #3). I don't agree with the behavior, I'd rather have Redmine store the attachments and then try to reattach them after the user resubmits. Added for Issue #3846. When time is logged to a project, it can now be included as part of the Activity stream. This also works on the cross-project Activity stream (e.g. http://example.com/activity). Added in r2877 for Issue #3809. Issue #2883 added the ability to edit the filters on a custom query. So if you use custom queries for reporting, you can now add or remove filters to modify the data that's displayed without having to edit the custom query itself. Jean-Philippe Lang added the ability to remove issue watchers in r2977. I've been missing this feature for some time, since I use watchers to make sure specific people are notified of changes to issues. User profiles (at /account/show/user-id) are now hidden unless the user has any public activity. This will be useful to hide user accounts who should not be listed in the public. Added in r2986 for Issue #3720. Mark Maglana released the Backlogs plugin, a plugin that will help a team visualize the work in progress and work remaining. The announcement contains a url to a demonstration of the plugin. Christopher Mann created a Workload plugin for Redmine. 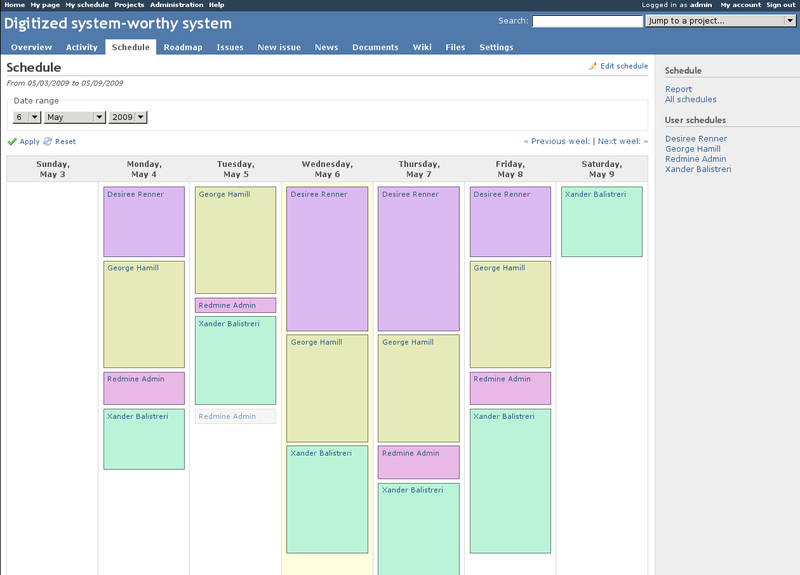 It looks interesting and might compliment the Schedules plugin. The plugin can be downloaded from the forum thread or from Github. Christopher Dell has created a plugin that will let Redmine save file uploads to Amazon's S3 service. I'm extremely interested in this, since S3 storage is very cheap and makes hosting Redmine in the cloud a lot easier. I'm planning on trying out the plugin and posting a review of it here. Ralph Juhnke has posted a new migration script to convert a Bugzilla install to Redmine. His script has been posted to Github and should work with both Redmine 0.8.x and trunk. Brian created the Redmine Repository Controls plugin. This plugin allows more fine grained repository access control and permissions, based on Subversion's SVNAuthz file. It currently only supports Subversion but he's left the ability to support any SCM that uses WebDav. More information can be found on it's Google Code page. Daniel Neis Araujo and Nicolas Bertet both created two different risk management plugins for Redmine. The plugins are both trying to make it easy for Redmine users to define and evaluate the different risks that are involved in a project. As I haven't looked at either one yet, if you are using one please let me know what you think in the comments. I have a lot of updates from Redmine for the Community Updates so I'm going to split them into a few posts. This update will cover events from July 13th through September 1st. Adam Soltys created a patch to add branch support for the git SCM repository. This patch will let you browse through all of the branches in a git repository including the revisions and diffs. It's gone through a few bug fixes but I've had some great experience using it in production on my Redmine so far. This was committed in r2840 for Issue #1406. If you would to try this out, my Stuff To Do project is public. In r2841 Jean-Philippe Lang fixed a bug that prevented custom columns from working with the issue list PDF export. I added a small tweak to the Journal entries (Issue notes) so any lists are aligned properly when Gravatars are enabled or disabled. Committed in r2848 for Issue #3771. Haru Iida has made several updates to his Wiki Extensions plugin. It's under rapid development so if you're interested in it I'd recommend watching the forum thread about it. Haru Iida also released a few new versions of the Code Review Plugin with a bunch of bug fixes and compatibility updates. You can find the release notes in these forum topics: Code Review Plugin 0.2.0 Released. and Code Review Plugin 0.2.7 Released..
Kumudha Rangachari posted the Global Filter plugin which will display a list of your global filters on the Redmine homepage. This would be very useful if you use saved Queries a lot and need to navigate to them quickly. The wiki page has some documentation as well as the Readme file on the Github project. It also includes a related change which I think is interesting. On the issue list there will be a new set of filters which can be used to further the issue list to show only specific projects. This is visible on the wiki page in the screenshot at the very bottom. Personally, I think this feature would be good to be included in the Redmine core. Robert Chady created a plugin that adds the ability to automatically assign an issue to a default user when it's created. I'm thinking of using this on my smaller projects, where one person is responsible for the majority of the work. You can get the plugin from Github and read about it in Issue #482. I'm thinking about writing these posts at the end of every month. Let me know if you like that idea in the comments below. 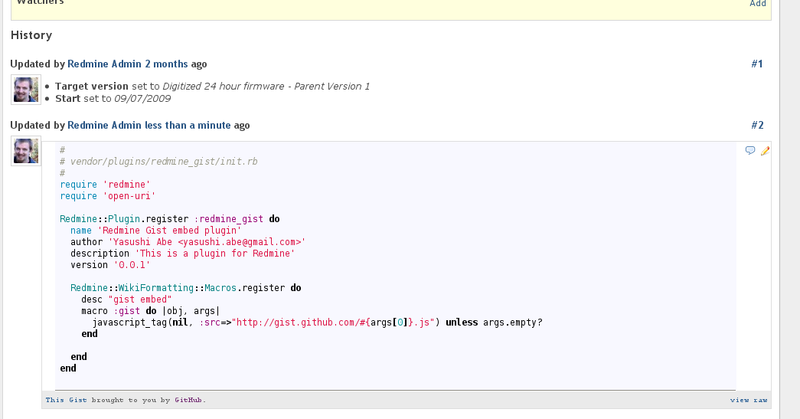 Github provides a service called Gist, where you can share snippets of code or text with others. What I like about Gist compared to other sites is that you can copy and edit other people's Gists to improve them. Yasushi Abe wrote a very simple plugin for Redmine that gives Redmine the ability to embed a Gist into the Wiki. Once it's installed, it's used by calling the gist macro with the Gist id like gist(113685). Since the plugin is so short, I'm going to include the entire plugin here. To install it, just create a directory called vendor/plugins/redmine_gist and copy this file into it. One thing I did discover is that the Gist system doesn't allow sharing private Gists this way. So you will have to make sure that any Gist you post is public. Let me know in the comments if you're using this plugin and what you are using it for. It's time for another update on what's been happening in the Redmine community. This installment covers from May 18th through July 12th. Redmine's mail handler is a very powerful component, allowing users to send email to create new issues or update existing ones. r2789 added some additional options, including the ability to accept email from unknown users and automatically create accounts for them. This makes it easy to publish an email address for anyone to send new requests directly to Redmine. 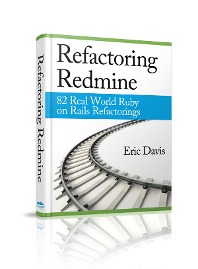 The about script, commonly called script/about, is used to let someone know what version of Redmine and Ruby on Rails you are running. #3387 enhanced the script to also include information about the installed Redmine plugins and their version. I know this will help me support my plugins by understanding what versions people encounter bugs on. When branches are merged in Bazaar, a merge commit is performed. Redmine wasn't able to parse these merge commits which causing some commits to be missing from Redmine's database. Scott Aubrey supplied a patch for parsing the merge commits correctly, which was committed in r2780. r2777 included a major internal change to how Enumerations are stored. Enumerations include time entry activities, document categories, and issue priorities. To the user or administrator of Redmine, this change has no real impact. But plugin developers can take advantage of this change by being able to define their own custom Enumerations. If you are a plugin developer and need to store data that is similar to the existing Enumerations, I'd recommend you try to take advantage of this change. A few plugin hooks were added for plugin developers. I also noticed that Jean-Philippe Lang has started development on user groups in a separate groups branch. User groups is one of the major features scheduled for 0.9 and I know several organizations that are looking forward to this feature, especially the time savings it'll have. There's no time estimate when this will hit trunk but I suspect it will be over the next few weeks. There was a huge number of plugins developed over the past months. I'm so happy that the community is really innovating with plugins. Edouard Brière created a Redmine plugin that will send issue notifications to a Campfire room. This would be useful to get real time notification of Redmine updates into your company chatroom. I wonder if someone will create one of these for IRC. Haru Iida has released a new version of the Code Review plugin. This is a minor release that includes some bug fixes from the last release. Shaun Gilroy has released a plugin called Developer Rates. From what I've heard, this plugin will let you attach an hourly rate to each time entry in Redmine. 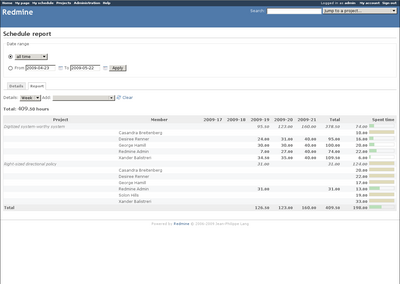 It's worth a look if you want to track any hourly costs in Redmine. Jan Schulz-Hofen has released the HoptoadServer plugin. Hoptoad is a service that will collect and manage errors from a Ruby on Rails application. The service provides a free plugin that you use to report to the Hoptoad servers. The HoptoadServer plugin allows Redmine to act as a Hoptoad server, replacing the need for the Hoptoad service. I'm already using this plugin with a few applications I'm hosting and I've been very happy getting all the errors sent directly to Redmine. Toshiyuki Ando has released a plugin to integrate the Hudson continuous integration system into Redmine. The Hudson plugin has been under active development, with several releases in the past month. I don't run Hudson, but the integration this plugin provides is making me consider a switch to Hudson. Joe Chin Hi Rene posted an example script that can be used to import issues from a CSV file into Redmine. If you're looking for a quick way to get a bunch of issues created, this script might be a good starting point. Ciaran Jessup has released a Laconi.ca plugin for Redmine that will integrate Redmine notifications into Laconi.ca, Twitter, or Identi.ca. Once configured, this plugin will send notifications to the service making it easier to other people to follow what's happening in Redmine. This continues the recent trend of having Redmine send it's notifications out to external services. Mischa The Evil has uploaded a new version of the Squeejee theme for Redmine. This is a darker theme than the default Redmine theme and includes a wide variety of graphics. Mischa has done a terrific job of documenting which versions of Redmine, browsers, and plugins are compatible with it. If you're looking for a high quality theme with great support, I'd recommend trying anything Mischa packages. Mischa The Evil also released a few updates to his Redmine Collapse plugin. This plugin modifies the default layout of Redmine so the entire sidebar can be hidden away from view. This is useful if you work with a lot of data or need more monitor space. Once again, Mischa has some great documentation on it's compatibility on the plugin page. Konstantin Zaitsev has posted a new theme for Redmine, titled watersky. 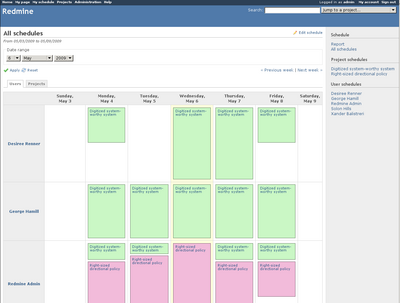 This is a nice blue theme for Redmine, using images instead of text links on the menus. Haru Iida released another plugin which adds a few new wiki macros to Redmine, titled Wiki Extensions. If you're using the wiki in Redmine a lot, you will want to take a look at the demo page he put up to see if there's anything you could use. If you hear about something in the Redmine community that you think is useful, please let me know about it and I'll try to spread the word. This is the second installment of what's happening the Redmine community. This installment covers from March 28th through May 18th, which ended up being somewhere around 700 changes, messages, and updates. I've tried to highlight some of the major code changes and events in the community. Redmine 0.8.4 was released this past weekend. It's a bug fix release with a security update may affect people running Phusion Passenger. The list of bugs fixed in the release can be found on the changelog. Since this fixes a potential security issue (below), all users are recommend to upgrade or audit their Redmine install. The random sequence generator used by the autologin token wasn't being checked if it was creating unique values. This generator was replaced with the one from Ruby on Rails in ActiveSupport::SecureRandom and a database validation to improve security. Alexander Pavlov included a database query to see if you have been affected by the bug. Jean-Philippe Lang added an option to send email notification of wiki page creations and changes in r2749. It can be enabled in the Administration Panel under Email Notifications. The email notifications look good and include a link to view the diff of the wiki page on Redmine. 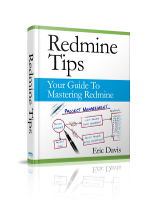 Jean-Philippe Lang committed yet another great feature to Redmine in Issue #706. Now a user will be able to have multiple Roles on a project, making it easier to control permissions and security. 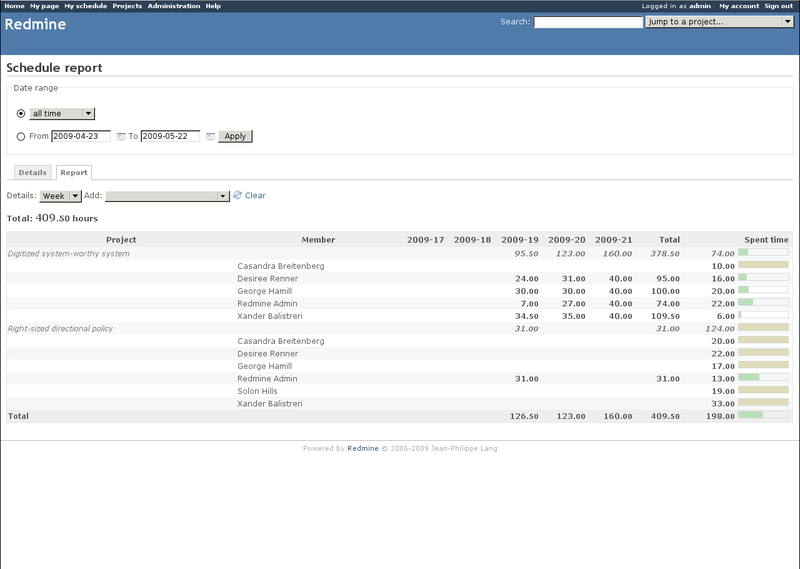 I'm going to start using this feature by separating out some common Roles like "Bookkeeper" and "Reports". Since this was a pretty major feature, there are going to be a few bugs to work out of the system as it's used. I'd recommend trying it out in a development environment for now and waiting a week or so for any major issues to be resolved. script/about is a Ruby script that will print out information about the current Redmine environment including library versions, database versions, and other debugging information. It looks like there was an error on a Ruby on Rails update so the script would only load the development environment. In r2733 the missing library was added so script/about should work for production instances again. Andrew Chaika just released Redmine Blog 0.0.3. This is a plugin that will give users the ability to write blog posts inside of Redmine. I think this could be very interesting on larger projects where teams want to store knowledge about the project inside of Redmine itself. Haru Iida released a Code Review plugin for Redmine. 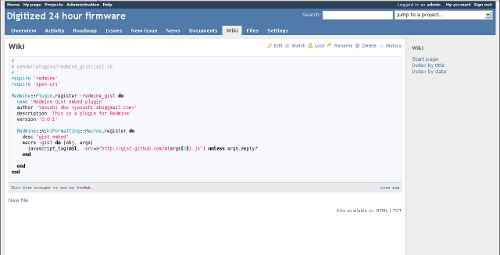 This will let a user add a code review on a particular piece of code in the code repository. I'm considering using this on my Open Source plugins so others can help to review and improve the code. This is the first installment of regular updates of what's happening the Redmine community. I'm going to highlight the recent code changes and some important events by community members. This installment covers from March 20th through March 28th. There was a lot of activity this past week with Jean-Philippe fixing a lot of bugs that have cropped up in trunk. In #3194, Chaoqun Zou noticed that if an issue's status was changed, the email notifications would use the old Status name in their subject line. This was fixed by a minor change to the emailing methods in r2673. Deleting a parent wiki page will prompt about removing child pages. Issue #3202 has some more details about this change. Jean-Philippe Lang committed a very nice feature to the Issues list in r2696, Issue grouping. Now the Issue List can be grouped by a specific column. Brad Beattie just released a new version of the Schedules plugins. This version should be compatible with both Redmine 0.8.3 and trunk. I've been using Schedules everyday since it was first released to help plan out my day. Andrew Chaika has been busy developing a few plugins for Redmine. He has an Local Avatars plugin that will let administrators use local versions of user avatars instead of the Gravatar service. Like he said, this would be useful for corporate emails that can't use Gravatar. Not to be content with only one release, Andrew Chaika also released the first version of the Issue Vote plugin. This plugin will allow users to vote on issues. This would be extremely useful for public or Open Source projects to discover user interest. I'm going to be looking at adding it to my Redmine soon. I've also released the first version of the Redmine Rate plugin and an update to the Budget plugin. I personally think they are great plugins, but I'm little biased. Farzad FARID recently wrote up a great tutorial for synchronizing two git repositories with Redmine. 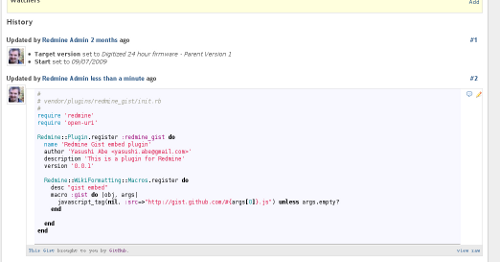 In his example, he configured his Redmine git repository to sync up with a GitHub one.